The magnificent, roofless remains of Linlithgow Palace occupy the top of a mound of high ground between the centre of Linlithgow and Linlithgow Loch. Immediately to its south is St Michael's Parish Church, with whose history its own is closely entwined, while the loch sweeps round to its north and west. There was probably a royal manor house on this site in the 1100s, but the earliest clear reference comes with the arrival of Edward I of England in 1301. He took an existing manor and built around it a large earth and wood fortress, enclosing St Michael's Church, which became a storehouse. 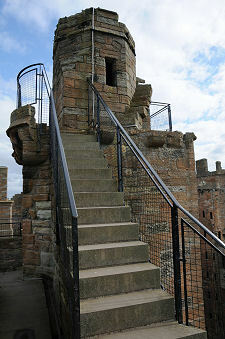 Linlithgow remained in English hands for 13 years, and was used as a residence by Edward II in October 1310. After their defeat at the Battle of Bannockburn in 1314 the English abandoned the fortress. The Scots removed the English fortress and repaired the manor, which saw occasional use by both David II and Robert III. In 1424 an English attack led to the burning down of most of the town of Linlithgow and the manor house. This triggered a programme of building by James I from 1425 which was continued by his grandson James III, and later by James IV, V and VI. Over the following hundred years this produced much of the palace whose remains are visible today, though rebuilding and alteration continued until the completion of the replacement north range in 1624. James I's palace focused on the east range, which contained the main entrance. North and south ranges were also constructed, probably leaving a C-shaped building open (and very lightly defended) to the west. 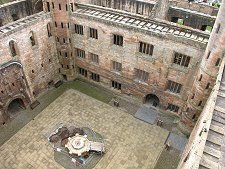 The centrepiece of James I's palace was the Great Hall, still visible today in altered form in the east range. James III undertook various works at Linlithgow following his marriage to Margrethe, Princess of Norway and Denmark (see our Historical Timeline.) These probably included the completion of the south range and the building of the tower at the south west corner of the palace. 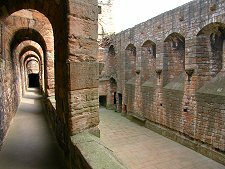 James IV completed the palace with the construction of the west range around 1500. 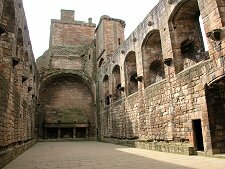 He also rebuilt earlier parts of the building, including the Great Hall and added the barbican designed to strengthen the defences of the entrance. 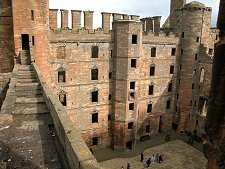 James IV left Linlithgow Palace in August 1513 to march on northern England in an attempt to help the French, under attack at home by Henry VIII. He left behind his wife, Margaret Tudor, sister of Henry VIII. It is said Margaret spent James' absence in the lookout post perched high on top of the north west tower, watching for his return. Her wait was in vain: James IV was killed at the Battle of Flodden. 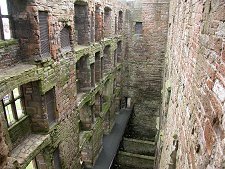 Queen Margaret's Bower, as this vertiginous spot is now known, is open to visitors and offers some of the best views of the palace itself and of Linlithgow and the surrounding countryside. 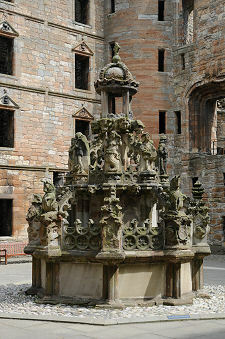 James V was born at Linlithgow Palace on 10 April 1512. He was responsible for closing the old main entrance and replacing it with one in the south range, facing the town of Linlithgow. He also built the outer gate to the south of St Michael's Church. 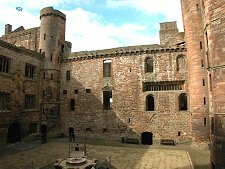 James died on 14 December 1542, six days after his daughter Mary had been born at Linlithgow Palace. 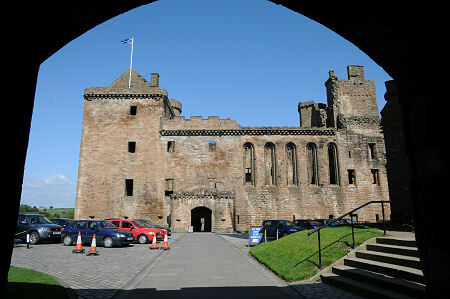 Mary Queen of Scots had little impact on Linlithgow during her reign, and by the time James VI succeeded to the throne on her abdication, Linlithgow was said to be in a state of disrepair. Things got so bad that on 6 September 1607 the north range of the palace simply collapsed. It was rebuilt between 1618 and 1624 and was used during the winter of 1650-1 as a residence by Oliver Cromwell. Linlithgow Palace seems to have continued in use, and was last visited by the Stuart family when Bonnie Prince Charlie stayed here in 1745. In January 1746 it was used by Government troops under the Duke of Cumberland who were pursuing Bonnie Prince Charlie north towards their eventual meeting at Culloden. When the troops departed on 1 February 1746 they left the palace ablaze. The palace you see today is much as it was left by Cumberland's troops in 1746. The ground floor and first floor of the building are largely accessible, together with some basement areas. And in the corner towers it is possible to access some of the upper parts of the palace. But for the most part the floors and roofs have all gone above first floor level. What you are left with are a series of remarkably tall hollow shells surrounding the central courtyard. Also on view is the recently-restored fountain in the palace courtyard. This remarkable structure was originally commissioned by James V in 1537. Water and stone form an inevitable recipe for erosion, and the statue needed constant attention over the centuries. In the 1930s it had to be dismantled and rebuilt and in 2000 it was removed altogether for a total restoration. 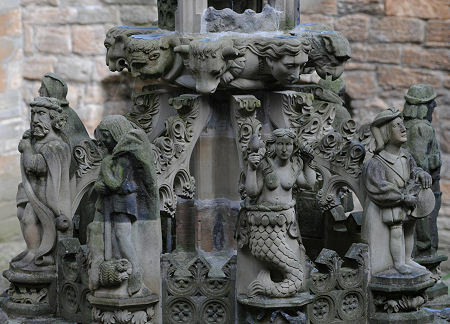 The fountain that was unveiled on 10 August 2005 is a magnificent testament to the stonemason's art, with about two-thirds of the original having to be replaced. To help preserve it for the future, the fountain now only operates at weekends in July and August.